Zircon is one of the oldest gemstones found on Earth, and it has been treasured since the Middle Ages. The stone has been said to bring prosperity and to promote honour and wisdom in its owner and it was once believed to have healing properties. Zircon is naturally occurring and can be a very valuable gem when found in larger single crystals. The gems are typically small due to their extremely dense nature, making large Zircon stones very rare and highly sought after. 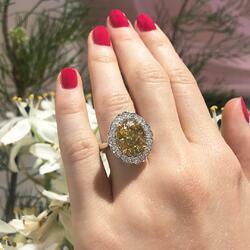 Our Oval Cut Zircon Cocktail Ring is a perfect example of the beauty of Zircon. Featuring an impressive 9.75 carat Oval Cut Gold Zircon at its centre, the ring is surrounded by Round Brilliant Cut Diamonds and set in 18 carat White Gold. The dazzling diamonds and two tone setting highlight the hue of the gemstone and display the natural beauty and elegance of Zircon. 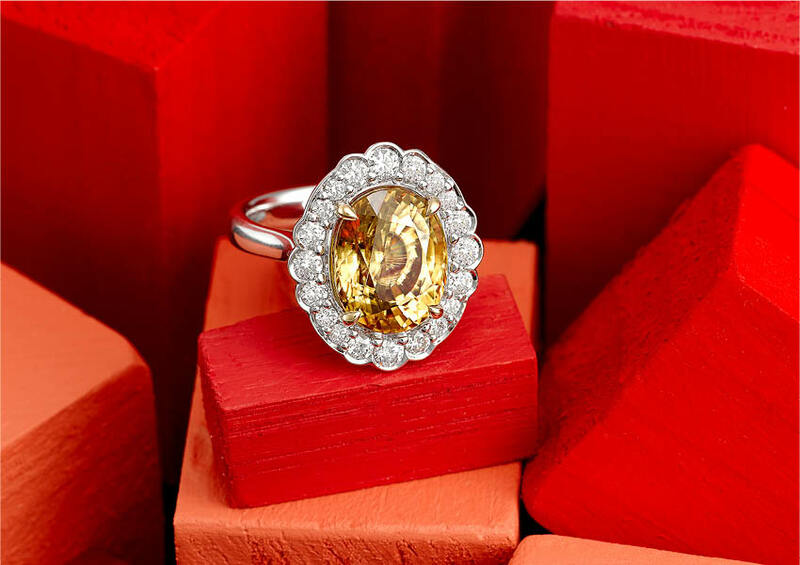 The earthy, autumnal hue of this Zircon ring makes it an exceptional piece for the autumn season. And the extremely large size of the gemstone is unusual for Zircon, ensuring you’ll never see anything like it. While this ring features a gold Zircon stone, Zircon comes in a varied palette of colours – it can be colourless, blue, red, green, yellow, orange, pink, or purple. Blue is the most popular colour of Zircon due to its rare occurrence and stunning hue, but the dazzling blue colour is rarely natural. Blue Zircon is usually the result of heat treating other coloured Zircon stones, producing an exquisite range of greenish blue to deep blue. The high lustre, refractive indices, and dispersion of Zircon give it an exquisite brilliance that is unrivalled by many stones. It often needs to be cut very carefully to avoid light refraction, and different cuts of Zircon will showcase its lustre in various ways. Brilliant cut is the most common way to fashion Zircon, but other popular styles include the Zircon cut, Oval cut, and Emerald cut. Zircon is sourced from multiple locations around the world – Afghanistan, Sri Lanka, Madagascar, Pakistan, and Nigeria being among the most popular. Some Zircon can even be found here in Australia. To see more of our stunning pieces, follow us on Instagram.